A Boston College hockey player, and cousin of celebrity starlet Lindsay Lohan, was assaulted late Saturday night. 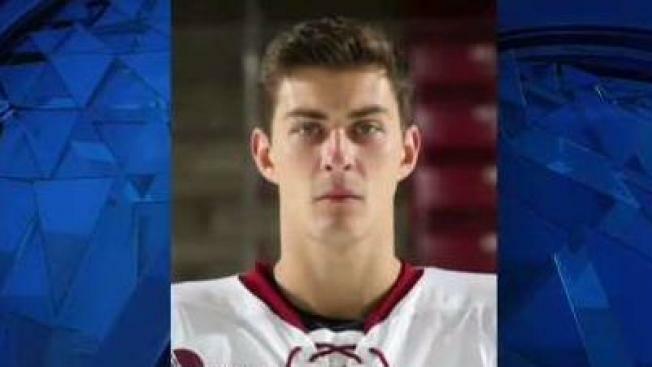 A New Jersey police officer and another man have been indicted in a January assault at a Boston pizza shop that left a Boston College hockey player with serious injuries. Prosecutors said indictments were returned Tuesday charging Daniel Hunt, 27, of Barrington, New Jersey, with assault and battery and Ian Salerno, 29, of Philadelphia, with aggravated assault and battery in connection with the 2 a.m. assault at a Domino's Pizza shop on Boylston Street on Jan. 19. The victim, 24-year-old Kevin Lohan, at the time a Chestnut Hill resident, was at the restaurant with a separate group. He is a cousin of Hollywood starlet Lindsay Lohan and played for the BC men's hockey team. Kevin Lohan's girlfriend told police that they were standing in line when a group of about six to eight people started pushing in line. Hunt, an off-duty Haddon Heights, New Jersey police officer, confronted and allegedly pushed the victim, starting a physical altercation. As members of both groups attempted to break up the fight, Salerno allegedly came up behind Lohan and punched him in the jaw, knocking him to the floor. Hunt and Salerno then allegedly fled the scene. Boston police used security camera footage and a receipt from a nearby bar where Hunt, Salerno and others had been drinking prior to the altercation, along with photos from social media, witness statements and other evidence, to identify Hunt and Salerno. Lohan was taken to Brigham and Women's Hospital, where he underwent surgery. As a result of the blow, his jaw had to be wired shut for three weeks and permanent metal plates were implanted in his jaw and cheek. Hunt and Salerno are scheduled to be arraigned in Suffolk Superior Court on Aug. 1.